Choose from among the best-built and safest water buffalo trailers on the market, a host of standard (and custom) features, and several shipping points to keep delivery convenient and economical. If you need assistance selecting from our wide-variety of water transport tanks for sale, our experts can help. What's more, our USA-made water buffalo trailers are durable, well-built, and guaranteed. For a wide selection of quality-made water transport tanks, for sale at a price that will satisfy your budget, contact us for a free estimate. In addition to fitting the water buffalo trailer's features to your specific job site requirements, your trailer will arrive DOT-compliant for safe use on public roadways, and turnkey (ready for use) with no assembly needed. Ask for a full list of water buffalo trailer options, features, and specifications. 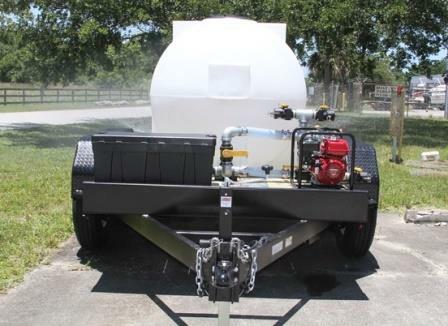 Our portable water tanks come with hose options for convenient filling and hassle-free spraying. The standard water buffalo tank/trailer package includes a 25' fire hose, nozzle, and fittings for high volume use. A port that's designed specifically for use with a standard garden hose (for low volume) is also provided. The Honda engine and pump is well-known for its reliability and makes quick filling (and spraying) a breeze. View the Water Buffalo Trailer Flyer for more information. Water transport tanks come in a wide variety of options and styles, to suit every project's need. Whether for the job site, farm, arena, remote area, or residential application, we have a water transport tank to fit your project's specific needs.